Twenty-somethings Mike and Teresa are convinced they can find the perfect house. They're searching the historic neighbhorhoods of Kansas City for a move-in ready Tudor with historic charm, within walking distance of shops and restaurants. Unfortunately, even a budget of $350,000 won't get it all. Fixers, ugly basements, tiny spaces and high prices might have them conceding that there's no such thing as the perfect house. 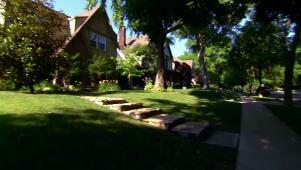 Newlyweds look for a 'perfect' home with historic charm until reality hits.